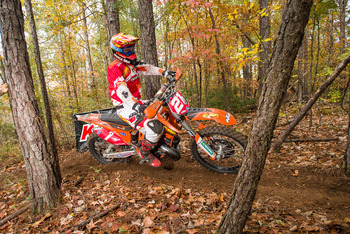 Maplesville, AL – Factory FMF/KTM rider Russell Bobbitt ended his season in the best way possible after capturing the win at the final AMA National Enduro round. Bobbitt rode strong through all six special tests. Throughout the day, Bobbitt was able to earn three of the six special test wins and held the lead from the second test through the finish. The newly crowned National Enduro Champion, Steward Baylor, came out to support his teammate but was unable to participate in the race due to an injury. Baylor will undergo surgery for his injury in the coming weeks in order to heal in time for the start of the 2013 season.